Iowa based Global Compassion Network is joining with the state’s largest grain bin manufacturer to bring ten homes to Kenya. GCN development co-coordinator Mary Graham says volunteers from three North Iowa churches will live among the nomads as they herd their sheep, cattle, and goats. “We’re working with missionaries there and it’s in a rural part of the country outside of Nairobi. The safety homes will be used as housing for the missionaries and that will help them in a remote area of unreached people,” Graham says. 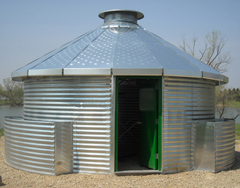 The so-called “Safe T Homes,” built by Sukup Manufacturing in Sheffield, are portable and resemble the top of a grain bin. The company provided 60 of the units to Haiti in 2010 following a devastating earthquake. Graham says another project is under construction in South America. “And that will be used for a little bit different setting, it’ll be a multi-purpose facility that includes a Bible camp and an agricultural center,” Graham says. “So, we’re really excited to be expanding and bringing the Safe T Homes around the world.” Graham says Global Compassion Network also responds to disasters in the U.S. Most recently, it provided volunteers to help tornado victims in Washington, Illinois clear debris.